Fewer UK companies are reporting signs of growth, and more firms say they have recently experienced at least one sign of distress, according to new research by insolvency and restructuring trade body R3. The research, part of a long-running survey of business distress by R3 and BDRC Continental, found that the number of companies reporting one or more signs of growth fell to 53% in September 2017, down from 64% in April and 62% in September 2016, and is the lowest figure since July 2013 (also 53%). Meanwhile, firms which said they had experienced one or more signs of distress jumped to one-in-four (25%), up from one-in-five (20%) in April this year and 21% in September 2016. The record low for the proportion of companies reporting one or more signs of distress is 17% in December 2015. 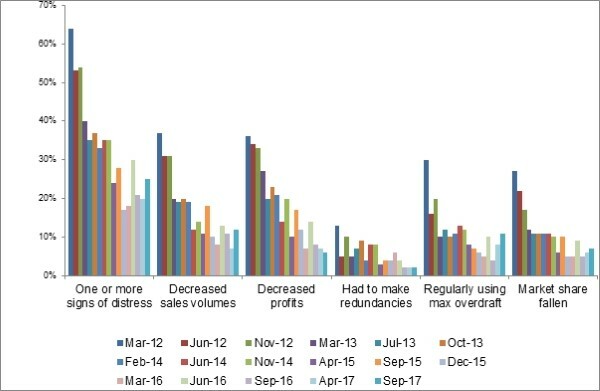 ‘Decreased sales volumes’ was the sign of distress reported by the greatest proportion of firms surveyed, at 12% – up from 7% in April 2017. Companies’ financial room for manoeuvre may be shrinking, too, as 11% of firms surveyed said they were regularly using their maximum overdraft, up from 8% in April, and nearly three times the 4% of firms who were in this position in September 2016. There is some room for optimism, however. Fewer firms are reporting decreased profits, with only 6% of respondents saying this was the case for them – the lowest proportion on record, down from 7% in April 2017, 8% in September 2016, and 36% all the way back in March 2012. Companies which said they had had to make redundancies continued to make up a tiny fraction of UK firms, at just 2%, a figure which has remained steady since September 2016, and which fits in with official labour market statistics from the ONS, showing the unemployment rate sitting at 4.3%, a level last seen in the 1970s. Of the five signs of growth monitored by R3, all of them experienced a drop compared with April of this year, while only one indicator – whether or not a business is expanding – was higher than in September 2016 (20% in Sep 2017; 16% in Sep 2016). 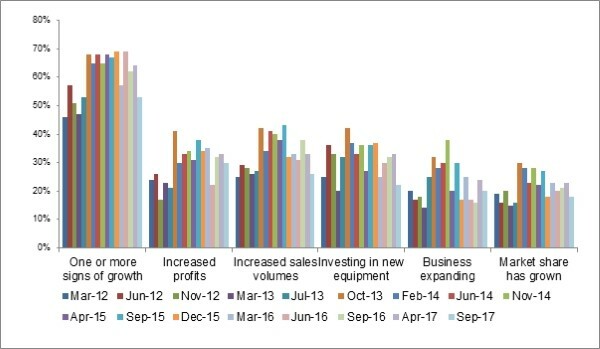 The number of firms reporting increased profits fell from 32% in September 2016 and 33% in April 2017 to 30% in the latest round of research, while the number which had seen increased sales volumes fell more sharply, from 38% to 33%, and then to 26% over the same period.